Construction began in 1880 on the Eastlake-style homestead of Marvin and Maria Kent. Marvin is our town’s namesake. Much of the materials used in the house were likely locally sourced since, among Kent’s many businesses, were a stone quarry and a plate glass factory. Completed in 1884, the home provided 7,335 square feet of living space with 20 rooms, including a ballroom and 10 fireplaces. During the 40 years the Kent family lived in the home, four U.S. presidents, either before or after they were in office, were quests in the home. When Warren G. Harding, William Howard Taft, William McKinley and Benjamin Harrison visited, they slept in the southeast second- floor bedroom. 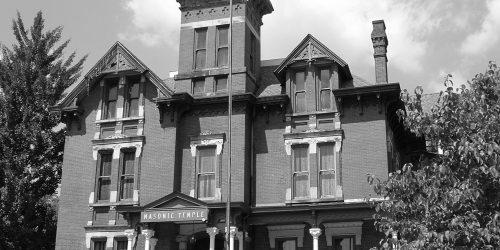 When Marvin’s son William died in 1923 the home was sold to Rockton Lodge 316 F & A. M.